We have brought back to life one of the iconic motorbikes of the 1980s: the Katana 1100. 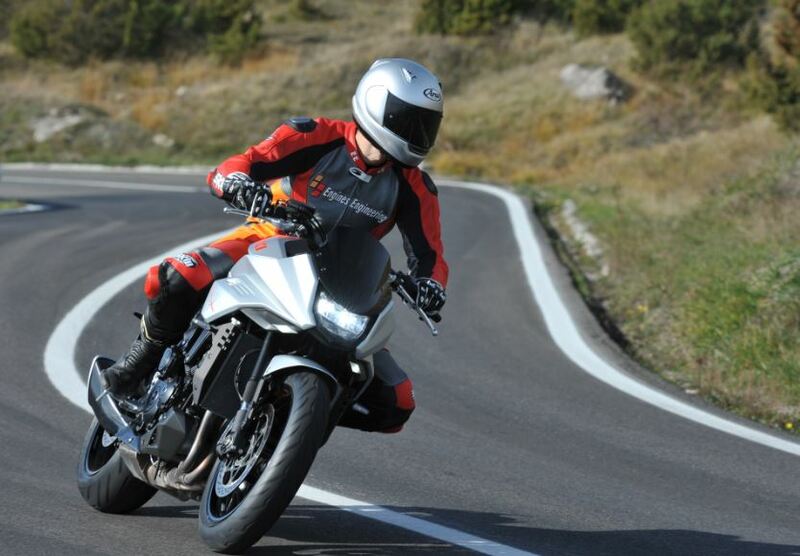 Based on the GSX-S1000F, the new “Suzuki Katana” is made by Engines Engineering in collaboration with Rodolfo Frascoli and the Italian magazine Motociclismo. Since last spring we launched a very ambitious project, a crazy idea: we wanted to bring back to life one of the most interesting and innovative bikes of the eighties, even too daring and controversial in design for that time, the Suzuki Katana 1100. The original idea was not to banter it, but we rather wanted to pay tribute to one of the most interesting and innovative motorcycles ever built. As a starting point for “our” Katana we chose another Suzuki, the GSX-S1000F, a sport tourer with a liquid-cooled four-cylinder engine from 146 hp at 10,000 rpm. We defined this bike “Favolosa in the curves” and equipped with a “… good sports engine, with a lot of torque at low speed already, at medium speed it makes you cling to the handlebars and such a badness at top speed “. 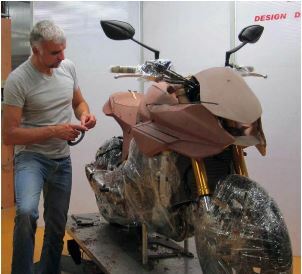 The idea of the “new Katana” has therefore an excellent starting point, and we thought then to an exceptional hand to draw the lines of our project: Rodolfo Frascoli, the father of Moto Guzzi Griso, Triumph Speed Triple and Tiger 1050. Engines Engineering helped us in the challenge, the Company just outside Bologna, born in 1979 and directed by the engineer Alberto Strazzari; a company specialized in the prototypes manufacturing, testing and road testing. 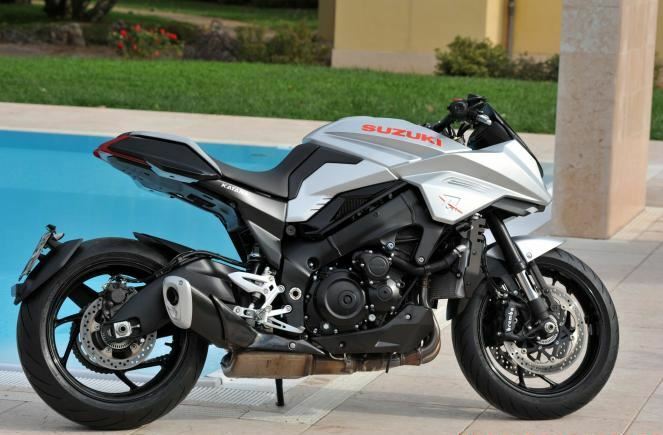 After months of work, our project has now come to an end and we welcome “Suzuki Katana”. Our team immediately started working around the Suzuki GSX-S1000F as technical basis for the new bike. The first step was transforming all the designer Rodolfo Frascoli’s 2D sketches into a series of as many computerized drawings. Computer modeling took two weeks of work from Engines Engineering’s specialized technicians. 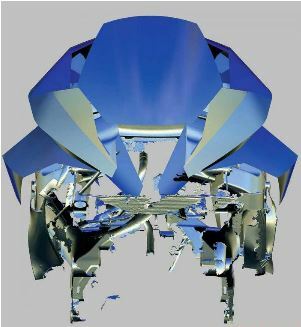 Another preliminary step was the optical scan of the bike, both completely “dressed” with fairing, tank, saddle and tail, and stripped from superstructures. This procedure allowed us to collect the real dimensions of the mechanical base and the frame of the GSX-S1000F. After having optically scanned the bike in all directions, the basic GSX-S lost the rear triangulation of support of the saddle to leave room for the new Katana frame. The supporting structure of the saddle is still based on steel tubes, but the double triangulation design has been transformed into an elaborate trellis to achieve a different, closer and higher driving position. At the same time, 3D drawings were computerized and converted into a “physical” model, defining what then became a first style prototype of the final line of the new Suzuki. This model was realized through a rapid prototyping process, by milling one block of Ureol from the solid (a particular modeling resin) with a numerical control machine. The block of Ureol was also used as a base for clay, a special clay that lends itself well to modeling, as it is easily ductile. Work has been done on volumes and ergonomics, then on surfaces, and details have been fine tuned. All of this has been done by looking at the model from different angles and distances and varying the intensity of light, to evaluate shadows and reflections. Clay is very advantageous since it is a very malleable material and can be shaped directly by hand after having slightly heated it. When it cools down, all this “ground” can be finished with the same tools used by sculptors. The intervention areas on our Katana are the central ones, i.e. the triangulation under the saddle that slightly widens and the cover of the same saddle towards the tank. We then slightly revised the front area. Obviously, the symbols linked to the first Katana could not be missing: the samurai sword and the Japanese symbol that represents the bike were dug on the side of the fairing that protrudes towards the tank from the front fairing. superstructures that replace saddle, tank and tail. From the “raw” state we then had to build the new superstructures. 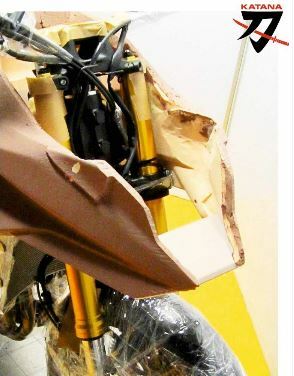 Such components were made of composite fibers (with the “mannequin” of the bike that literally served as mold), but also taken from the “full” exploiting the electronic scanning that was made of the various details and using the construction drawings generated by the computer to match them with Engines Engineering machine tools. The next step was making the prototype running. After checking that everything was fine, this step also allowed us to fine-tune the new driving set-up. The last stage was painting and polishing “our Suzuki Katana”.